This week, Your News to Know covers the top stories involving finance and the gold market. Stories include: Gold is cheap insurance no matter what the Fed will do, it’s time to face reality and buy in gold, and gold pushes to $1,200 in a more uncertain world. When it comes to cheap and reliable insurance, Forbes’ Olivier Garret sees no better choice than gold. Garret dismisses concerns that the metal is entering a bear market (due to a stronger dollar and rising stocks) because of one simple reason: gold will prosper no matter what the Fed does. As Garret points out, Janet Yellen’s policies are primarily accomodative to the markets – the Federal Reserve Chair has acknowledged that her governors are in a wait-and-see mode and has set a markedly dovish tone in her speeches. Garret also believes that Yellen isn’t particularly eager to hike rates even if the U.S. shows strong economic growth, which would leave inflation somewhat unchecked and therefore may cause gold’s value to rise. Even a series of rate hikes amid strong growth may leave real rates in negative territory, which is what really matters when discussing the metal’s prices. On the other hand, Garret notes that there is a very real chance the U.S. economy could finally roll over into a recession, stating that we are historically overdue for a broad-based market correction. All the catalysts for it are in place: a strong dollar, over-indebtedness, lower taxes and increased spending. In this scenario, Yellen might push interest rates into negative territory, having already stated that she sees them as just another tool in the arsenal. With this in mind, Garret says we are in a unique situation in regards to the yellow metal: every action that the Fed could take may ultimately turn out positive for gold. The analyst also lists risks from abroad as yet another reason to own gold: political tensions around the globe are on the rise, Europe is dealing with two different crises stemming from immigration and a collapsing banking system, and Trump’s feuds with multiple nations could spark a number of trade wars. Gold’s fall from its recent multi-year high was quickened by Donald Trump’s victory: many surrendered to optimistic growth forecasts, and the Fed’s December hike merely added fuel to the fire. Yet Newsmax’s Stephen McBride believes the current optimistic outlook is nothing more than a case of market watchers putting on their rose-colored glasses. As it is now, everything rests on both the Fed and the President-elect being able to follow through with their plans to ignite economic growth. Although markets are already pricing in the Fed’s projected three rate hikes in 2017, the ever-increasing U.S. debt could quickly put a dent in those plans. With a debt of nearly $20 trillion (equaling 105% of the country’s GDP), 6% of 2015’s budget was spent on just interest payments despite record-low interest rates. Should the U.S. government’s fiscal follies come to the forefront as they did in 2011, McBride believes the Fed could be forced to reverse course. The problem of rising rates is tied to Trump’s promise of increased budget spending. More specifically, it would greatly boost the cost of his proposed $500 billion infrastructure package. Again, the markets are already moving as if the proposition will passed – if it fails to happen, McBride expects the outcome to be very negative. Adding to this the difficulties of implementing tax cuts, McBride wonders if Trump’s administration is headed the same way as Obama’s – a lot of hope early on and a loss of confidence later on which, in Trump’s case, would hit the markets the hardest. McBride dismisses the cheery outlook on the U.S.’ economic future as the reasons behind it being unsound, and by extension, so are those behind gold’s fall. In 1912, J.P. Morgan stated that “money is gold and nothing else”, and McBride argues that the same still holds true 104 years on. Gold is one of the rare financial assets that isn’t someone else’s liability. And with total liabilities in the U.S. exceeding GDP by more than 3.5 times, that’s a pretty important quality to have in an asset these days. After all, the belief that the Federal government couldn’t fund its then $15 trillion of liabilities helped the metal skyrocket in 2011, and today, those concerns are even more valid. 2017 is looking to be an uncertain year, and as such, it could put the yellow metal on track to increase in value. Recently, gold crossed an important key level of $1,200 and several analysts believe it’s ready to continue this recent upswing. 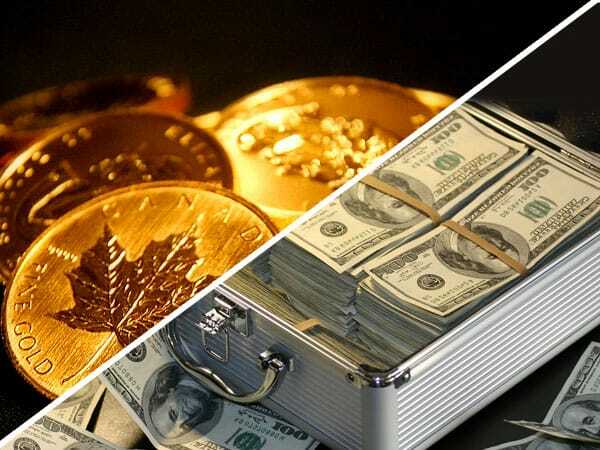 While fears revolving around terrorism, conflict and all-out wars – especially in the Middle East – are sure to keep gold’s appeal high, CNBC’s Patti Domm points to geopolitical risks in Europe as a potential wild card that could propel gold to new heights. The first of those comes from France, with presidential candidate Marine Le Pen saying the country would leave the euro if she is elected, undermining the eurozone as a result. Speaking about gold’s recovery, chief HSBC commodities analyst James Steel said: “We think there’s sufficient geopolitical risk and some of the more traditional reasons — tightening money supply, relatively low recycling levels. We have elections in Germany and France, so the geopolitical risk elements would not necessarily be just U.S.-centric. Also we’re coming off a year, last year when emerging market physical demand was rather poor.” Steel also listed Trump-fueled protectionism as yet another positive for gold. Many analysts see the push to $1,200 as a step toward $1,300, with Steel predicting an average gold price of $1,282 an ounce in 2017. George Gero, managing director at RBC, also believes gold could reach $1,300 this year due to the same concerns. “Elections are coming up in France and Germany, and they could be problematic, worrisome. And then Turkey, where the Turkish lira went right through the intervention by their central bank. I think all over the globe we’re starting to see interest in another asset that is liquid and convertible into other currencies. We’re starting to see more interest picking up in gold on a daily basis,” said Gero. Jim Wyckoff, senior analyst at Kitco, believes the real concern about populist candidates is a reversal of globalization which puts in question not only the future of the euro zone but the global economy as well. This uncertainty, coupled with potential changes in relations between the U.S. and China and Russia, leads Wyckoff to predict that gold could reach $1,400 by 2018.